When I originally made this pie, I used my go-to pie crust recipe. (Related: If you have issues with pie crust, I have also done a handy tutorial for you. You’re welcome.) The only problem was that this pie requires some chilling, and a normal pie crust just doesn’t hold up as well post-refrigerator. So, instead, I went with an oaty-nutty-coconutty crust. It’s a little bit like your pie is sitting on top of a Pecan Sandie cookie. Does anyone have a problem with that? Thank goodness not. We can totally be friends. Layer on some bananas, pour on your coconut custard (try to refrain from simply spooning said custard directly into your mouth), let it all chill, and finally top with some whipped cream. Then do your darnedest to not just take a fork straight to the pie plate. At least have the decency to cut yourself a (large) slice first. It is the polite thing to do, after all. For the crust: Preheat oven to 400 degrees. Grease a 9-inch pie plate with butter. Pulse the oats, pecans, and coconut in a food processor until the mixture resembles a coarse meal with some larger pieces of oats. Place in a bowl with the flour, brown sugar, and salt. Mix, then stir in the melted butter and mix until everything is well combined. Press mixture into the pie plate and bake for about 12 minutes or until crust is golden. Set aside to cool. While crust is baking, make the filling: In a small bowl or measuring cup, whisk together ¼ cup of the whole milk with the cornstarch. Set aside. In a medium saucepan, combine the coconut milk, remaining whole milk, sugar and a pinch of salt. Heat over medium heat until the milk mixture is hot and steamy. While mixture heats, whisk the egg yolks in a medium bowl until creamy. Once milk is hot, very slowly stream about ½ cup of the hot milk into the egg yolks, whisking constantly. Slowly add the egg mixture back into the pot, then whisk in the cornstarch mixture. Whisking constantly, return to the heat and continue cooking over medium to medium-low heat until the mixture is thickened and bubbly. Remove from heat. Whisk in the butter and vanilla, stirring until butter is melted. Place half of the bananas along the bottom of the pie. Top with half of the custard. Layer on the rest of the banana slices and top with the rest of the custard. Allow the pie to cool to room temperature before placing in the refrigerator to chill for several hours or overnight. Before serving, make the topping: Place the chilled whipping cream in a cold metal mixing bowl. Beat (preferably with chilled beaters) on medium speed until frothy. Add the powdered sugar, vanilla, and cornstarch, which will help to stabilize the whipped cream. Beat on high speed until stiff peaks form. 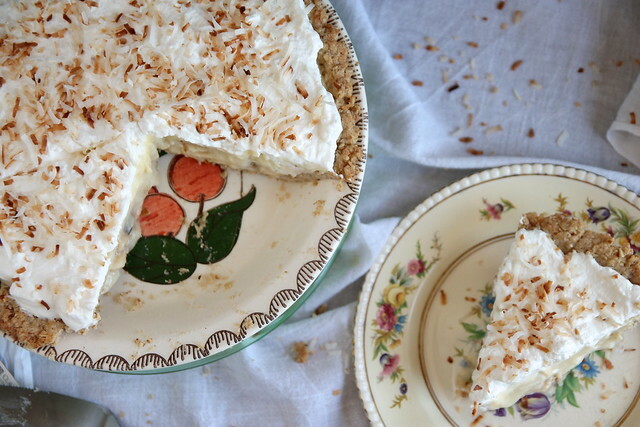 Spoon onto the chilled pie and top with toasted coconut, if desired. If I were Superman, my kryptonite would be cream pies (specifically banana, but coconut is a close second). I like the idea of changing up the crust to break tradition. In a tutorial online I saw Christina Tosi (of Momofuku Milk Bar) use crumbled up cookies as the crust for one of their pies and I’ve been wanting to try something similar myself. So, banana-coconut pie, sitting atop a Pecan Sandie? Yes, please. YES! I would be destroyed by cream pies, too. I just can’t say no! Bananas and coconut?! Yes please!!! Why hello fluffy tropical days in a crust. Nice to see you. Ah hey, Steph and Steph! Yup, I wish I could rock baby Avery in a rocking chair all day long…she’s so adorable! 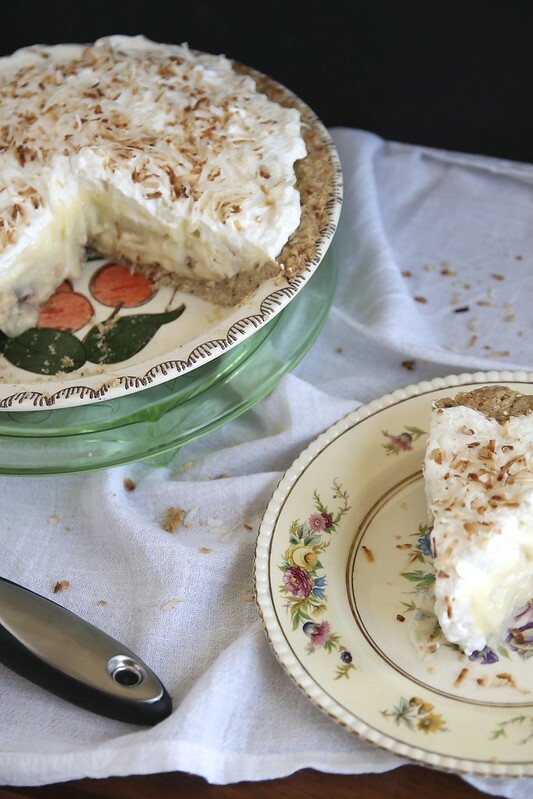 Coconut cream pie has always been one of my faves and a layer of bananas just makes me want to eat this for breakfast. You two ladies. Let’s do pie! I think this totally counts as breakfast. There are oats and bananas involved. It’s practically health food! Love banana cream pie! This looks delicious!! Yayyyyy! So happy Stephie is here to fill in while you snuggle your cutie patootie lil sweetie!!! What a gorgeous, creamy pie!!! Beautiful pie. You just can’t go wrong with banana cream! Can I just take the entire pie? Please? It looks so creamy and delicious and perfect! And don’t worry, you aren’t the only one who had those thoughts about baby Avery. So adorbs! Banana cream pie totally takes me back to days when I use to snoop around my gran’s kitchen. She is a magician when it comes to bananas and cream. Thanks for your take on this pie, it looks divine! No!!!!! Although I will try real hard to not scoop off the cream and coconut custard with my finger, I cannot guarantee it! This pie is OUT-OF-THIS-WORLD-GOOD! I can’t even put it in words! I’m just drooooooling all over my computer screen!!!!! What a fantastic pie! I bet it is creamy and oh so delish! YES to everything about this, especially that nutty crust! I have not had banana cream pie in ages!!!! The addition of coconut is genius! 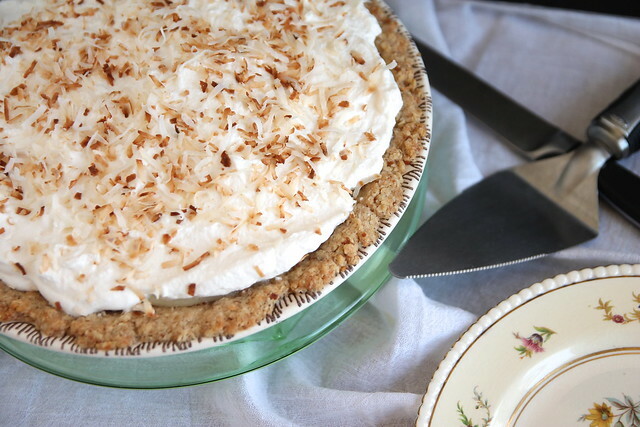 This chilled pie is perfect for any summer gathering. Now, who is going to make me some? Stephie, I am looking at you! This pie looks so good! I am definitely also a little miffed that I can’t snuggle Miss Avery whenever possible, but I will accept this pie as a consolation prize! 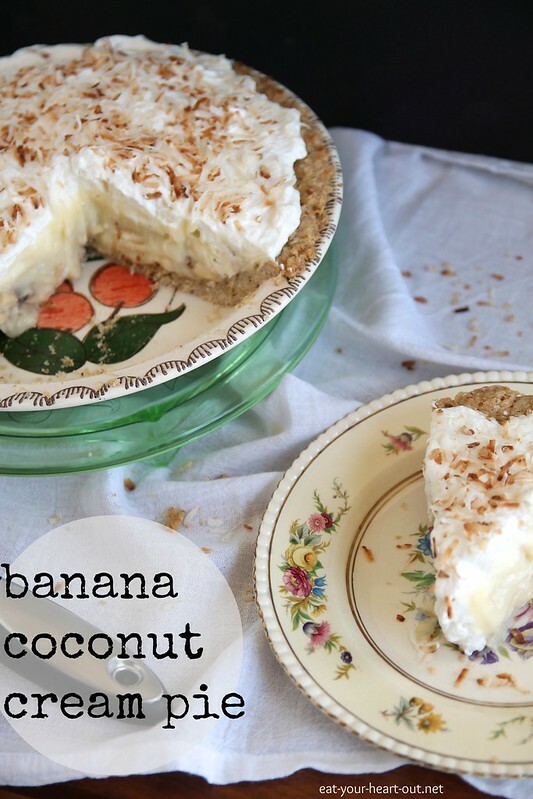 hi this looks amazing, i would love to try it but i was just wondering how much i would need of the coconut milk for the filling in either ml or grams.